An Indo-Russian joint venture to produce 200 Kamov light weight multi-role military helicopters under a $1 billion deal has been registered in India and efforts are on to co-produce them, a senior official of the Russian defence major Rostec has said. The joint venture was registered in May, said Victor Nikolayevich Kladov, the head of the Department of International Cooperation and Regional Policy, Rostec State Corp, Russia’s umbrella organisation for 700 hi-tech civilian and military firms which was established in 2007. Sixty Kamov-226T helicopters will be supplied to India in fly-away condition, while 140 will be manufactured in India under a $1 billion deal inked in 2015. “We are very happy to know that the joint venture has finally been registered by the Indian Government in May,” Kladov told reporters here ahead of the MAKS-2017 airshow that began today in the Russian town of Zhukovsky near Moscow. The Kamov Ka-226 is a small, twin-engined Russian utility helicopter. The Ka-226 features an interchangeable mission pod, rather than a conventional cabin, allowing the use of various accommodation or equipment configurations. The Ka-226 entered service in 2002. Variants of the Ka-226 have the NATO reporting name of Hoodlum. The Ka-226T is powered by 580 h.p. FADEC-equipped Arrius 2G1 engines by Turbomeca which enables the helicopter to land or take-off safely if one engine fails. – The passenger model can comfortably set up to seven people. – The transport model can carry one tonne within the fuselage or on an external sling and cargo platform can be installed to carry oversize goods. – The Ka-226T has two kinds of medical uses – medevac and intensive care. Medevac helicopters are equipped with stretchers to carry the injured, oxygen cylinders, and the requisite medical equipment. There are fold-away seats for medical staff. 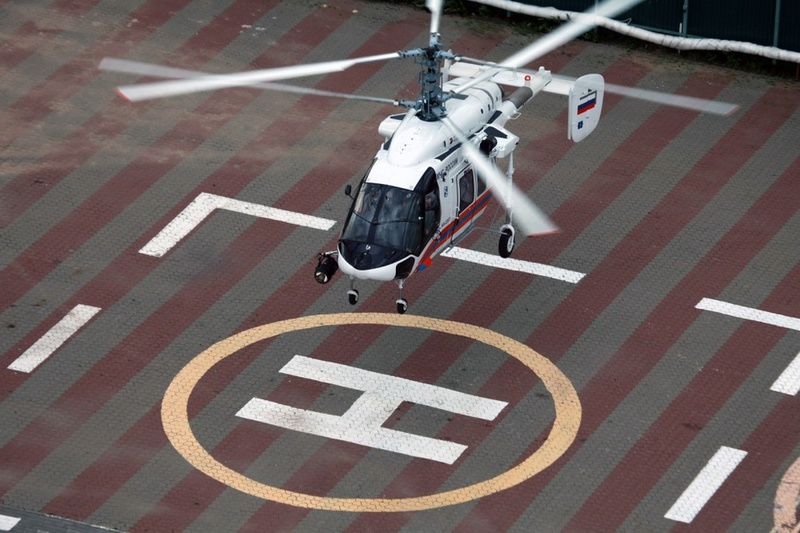 When used to provide intensive-care treatment, the Ka-226T can accommodate one patient and two medical staff. – As a police vehicle, the Ka-226T can transport up to six people and is excellently suited to law enforcement activities such as: ensuring law and order, patrolling areas, identifying and tracking criminals, and managing the traffic police. – The search-and-rescue version of the Ka-226 can operate in difficult climates and in a range of different environments, including mountainous areas. High hover precision makes it possible to get injured people on board safely. A twin turbine version of the successful reciprocating-engined Kamov Ka-26, (the Kamov Ka-126 is the single turbine version) the Ka-226 was initially announced in 1990. Originally developed to meet the requirements of the Russian disaster relief ministry, the aircraft first flew on 4 September 1997. Certification to Russian AP-29 “A” and “B” transport categories was granted on 31 October 2003. The Ka-226 entered production at “Motor Sich”, Zaporozhye, Ukraine. In December 2014 it was reported that India is in agreement with the Russian Federation to produce on its territory Mi-17 and Ka-226T. Under a 2011 contract with Russian Ministry of Defence, Kumertau Aviation Production Enterprise completed production of a batch of Ka-226.80 helicopters, which was delivered to the customer on 17 April 2015. “The planned scope of the assignment of state contract signed with the Ministry of Defence in 2011 fully implemented with ahead of schedule deliveries. Prematurely delivered a large consignment of helicopters. 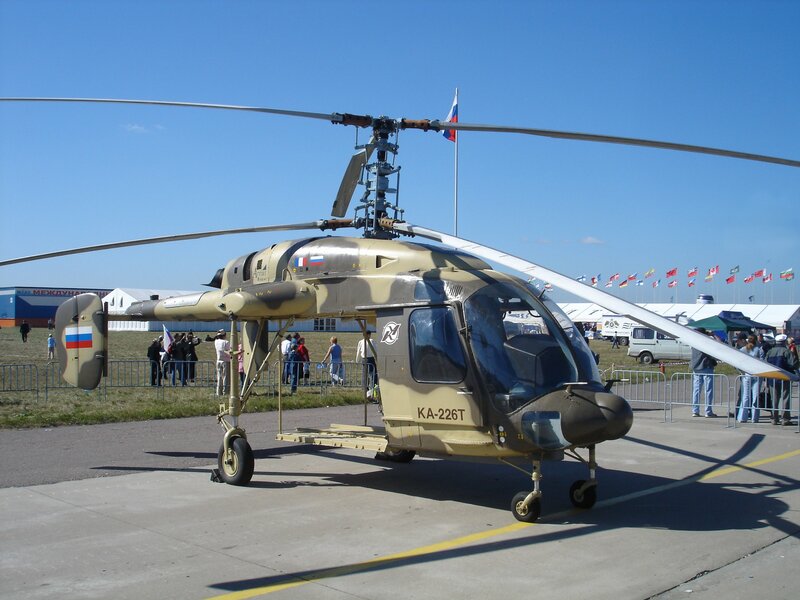 Previously, under the state contract with the Russian Defence Ministry were also delivered several Ka-226.80 batches”, – said the Managing Director of Kumertau Aviation Production Enterprise (KumAPP) Viktor Novikov. In April 2015 Certification of Ka-226T light multi-role helicopter powered by Turbomeca Arrius 2G engines (France) has been successfully completed in Russia. Two Ka-226T helicopters took part in the flight test programme. The version of Ka-226T powered by Turbomeca Arrius 2G engines offers much better performance compared to production Ka-226s powered by Allison 250-C20R/2 engines. It was reported earlier that deliveries of Ka-226 helicopters manufactured by Kumertau Aviation Production Enterprise (Ka-226.50 and Ka-226.80 versions) and powered by Allison 250-C20R/2 engines were started in 2005. The helicopters were delivered to the Federal Security Service of Russian Federation (at least six vehicles), Russian Ministry of Internal Affairs (11 vehicles), Russian air forces (a total of 36 helicopters should be delivered) and Ukrainian Ministry of Emergency Situations (1 helicopter). Next year the enterprise was to start implementation of a contract for delivery of 18 Ka-226TG helicopters to Gazpromavia. In late March 2017 Russian security structures received first 2 ship-based Ka-226Ts. Following selection of the Ka-226T to meet an India requirement for 197 helicopters, an agreement was signed in December 2015 for the creation of a joint-venture between Rostec, Russian Helicopters and Hindustan Aeronautics to build the helicopters at a new factory to be built at Tumakuru in India. The aircraft is fitted with trademark Kamov coaxial rotors, of advanced composite design, making the Ka-226 highly manoeuvrable and eliminating the need for a tail rotor. Instead of Rolls-Royce 250C engines, this variant is fitted with the more powerful Turbomeca Arrius 2G1. Each engine provides 670 shp, increasing the service ceiling to around 7,000 m, providing improved high altitude and high temperature operation. Helicopter has new avionics with multifunctional displays, automatic control system, navigation system, radar. It can be equipped with hoist system, helicopter sling, searchlight, additional external fuel tank. For search and rescue missions helicopter can be equipped with medical module. Gazprom specific variant based on Ka-226T model.